Posted by Shawn Kriewaldt. on Tuesday, December 11th, 2018 at 2:39pm. Today I'd like to help in formulating your “blueprint” for buying and/or selling your home this winter. Want to sell your home? Get a FREE home value report. Want to buy a home? Search all homes for sale. Though most people don't realize it, winter is actually a great time to buy and/or sell a home. In terms of buying: inventory will creep up relative to demand, and due to the colder weather and snow, not as many buyers will be out. If you're willing to brave the weather, it's likely you'll find a bargain at this time of year. Since there isn't as much competition at this time of the year, you won't need to rush through getting an offer written in fear of getting yours in too late. Another plus for buyers is that you’ll find that ancillary services like inspectors, title companies, and mortgage brokers will be more available in the winter. The spring and summer months are so busy for them that, often times, it takes longer to get through the many transactions they're dealing with. Because they aren't as busy in the winter, your transactions will likely go smoother and will have a reduced chance of any inconvenient and costly oversights. The winter provides a more realistic look at the home, as well. You'll be able to see how the house holds up in the harsh winter conditions. In terms of selling: though there are fewer buyers out there, the ones that look in the winter are usually more serious ones. Not many people will be looking in the winter if they think it'll be a waste of their time. If you’re not on the market as a seller, you’ll miss an opportunity to find a serious buyer. Winter is also a great time to stage your home with festive, holiday decorations. Why not make your home even more attractive amidst the beautiful snow? 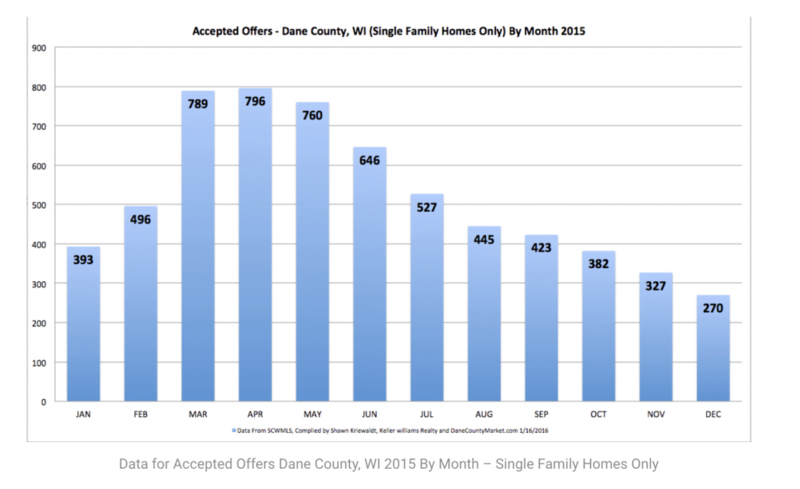 Take a look at the chart below, which illustrates Dane County's typical month-by-month trends in terms of home selling. Though the data is from 2015, we generally see similar statistics year by year in terms of accepted offers. We also see a mirrored chart for accepted offers on condos. Although there are less accepted offers during the winter months, there are typically fewer listings on the market and still a large number of listings sold. In general, if you're looking to buy or sell a home fairly quickly, buyer and seller motivation is at an all-time high during the winter. Just remember that the busy holiday season may make it a bit more difficult to schedule appointment times that work for everyone, so be flexible. For some more tips on buying and selling in the wintertime, check out the links below. Anyway, I'm sure you'd rather be out shopping and preparing for the holidays than listening to me. Therefore, please reach out if you’d like more tips or if you have any questions. I'm always here to help.